Inner tent made from mesh for fantastic ventilation when you are camping in warm/tropical conditions. Perfect when you want to feel the cool evening breeze and still be protected from unwelcome insects – the extremely fine mesh stops even the tiniest bugs from getting in. Can also be used together with the tent models Abisko Endurance 4 and Keb Endurance 4 when you camp in warm, humid climates. In addition, it can be used by itself in warm and dry conditions, or together with a tarp if there is any possibility of rain. Tent floor in 70D PU-coated nylon protects from damp ground. 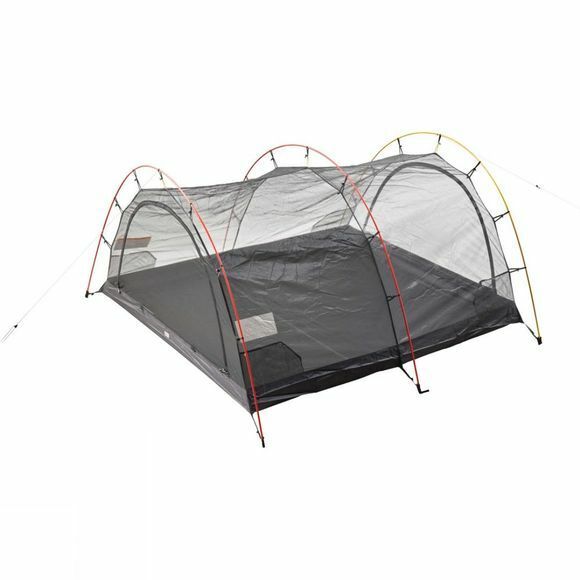 Complement with 2-4 Person Inner Tent Pitch Kit when being used separately or with a tarp. The poles from Abisko Endurance 4 and Keb Endurance 4 can be used, but if you only have the mesh inner tent you will need a set of poles in the Abisko Endurance 4 Pole Kit or the Keb Endurance 4 Pole Kit.